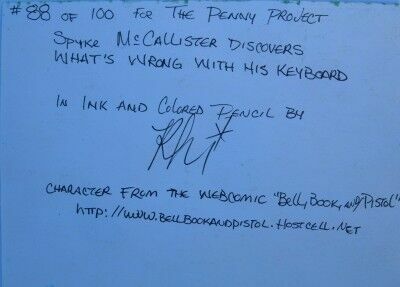 Inspiration / About the Art: Spyke McCallister’ in my webcomic Bell, Book, and Pistol, is 16 and has about 10 times the normal appetite of your normal 16 year old male. So since this is all about feeding the hungry, I thought I’d feature Spyke, the perpetually hungry. 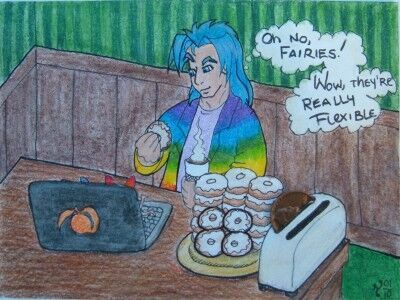 There’s also the bit about that Internet meme excusing terrible typing skills because the Fairies are [engaged in healthful exercise] on the keyboard. The Peach computer is a household in joke, since the in house tech guru is a Mac tech and keeps all the Macs in the house well fed and happy. Significance of number: Well, I needed a number and 88 looks like four donuts, and donuts made me think of Spyke and the number was free for the taking, so I ran off with it. Materials: I was all out of bristol, having cut it up for art cards (bad Rhi, save some whole pieces next time) so I decided to go ahead and use regular drawing paper and double it — that way I could glue the penny in a toaster slot and make it look like a waffle… mmmmmm waaaaaffles. I penciled it out with a mechanical pencil, then inked it with a set of Faber Castell PITT artist pens. After erasing all that pencil work, I opened up the stash of colored pencils and started layering in color. All the places I wanted to stay bright, I used heavy pressure and the woodless colored pencils, which are essentially really hard crayons. The rest of the area got a layering of watercolor pencils, which was then worked with a #4 flat shader brush. Then I went back over it with the regular colored pencils again for shadowing and highlights and such. Then the clever bit; I took a #4 round brush, wet it then loaded it up with lots of pigment by brushing the watercolor pencil until it was loaded with the right consistency, then carefully dabbed in the eye and hair highlights. After the whole thing dried, I touched up some of the black lines that had gotten buried in pigment, glued it up, and it was done. About the Artist:Rhiannon Starsinger’s birthday is January 24th, 1961 — everything else is subject to change. Currently residing in Redding, California. The Webcomic Website: Bell, Book, and Pistol. It is an alternate history tale set in a San Francisco where both science and magic work. It has humor, violence, romance, an intricate plot, strange and interesting characters… and much more. Anyone who donates to the comic and says they’re from the penny project, half of that will go to buy canned foods for a local food bank/shelter that fed me many years ago when I was very broke and a hair’s breadth from homeless. Tal is our buyer for the house, and while she’s not a coupon queen, she can do an amazing job of strrreeeeeetching our food dollars. Price: This piece is not currently for sale: There are great reasons to purchase Penny Experiment art. 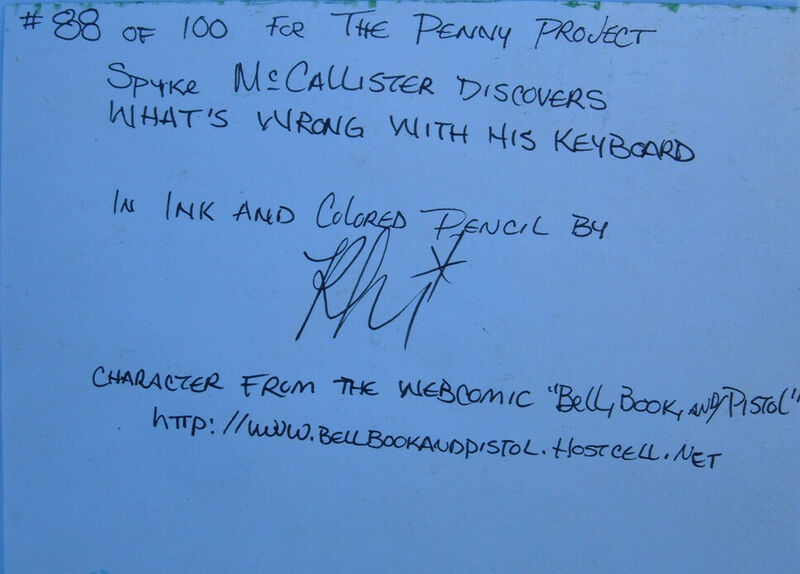 If you would like to purchase Spyke McCallister Discovers What’s Wrong With his Keyboard #88 or other artwork from this 100 Penny Postcard Art series, please email me and I will put you on my list to inform when this series is for sale. This entry was posted in Penny Art, Penny Experiment and tagged doughnuts, faries, peach computer, penny, Penny Art, Penny Experiment, penny postcard, Rhi, Rhiannon Starsinger, Spyke, Spyke mcCallister, waffles, webcomic. Bookmark the permalink.